The wait is over! Beyond the Page is here for the July School Holidays. There are over 100 events happening across the Wellington region between 7-22 July – all are free and all are loads of fun. Drag Queen storytimes, writing workshops, movies, lego challenges, robotics, comics and drawing, and even a special storytime on the cable car – so much to choose from. Visit the Beyond the Page website or Facebook page to find out about the range of events. If you had been alive in 1912, and scored yourself a ticket on the RMS Titanic, you would have been jumping up and down with excitement. It was the biggest most fancy passenger steamship ever built at the time. It was like a really posh floating palace. Some of the richest and most famous people in the world bought tickets on that first and only voyage. You would also have felt very safe, because the Titanic was built with 16 double strength watertight compartments, so she could survive a head-on crash that would only flood the first four compartments. Or if another ship rammed her in the middle only two compartments would flood. And then the unimaginable happened. On her first voyage, less than three hours after hitting an iceberg on April 14, 1912 she sank. Over 1,500 people lost their lives. Find out more about the Titanic by taking part in fun stories and activities to mark the 100th anniversary of the sinking of the Titanic, at your local library during the April holidays. The Library has lots of books and resources in the collection too. Search for Titanic in the easyfind catalogue You can also find loads of Titanic websites here. Tawa’s October Holiday Programme went very well, with over 50 adults and children attending. They came to experience the Pastimes of Past Times. Special guests Rachel and Joe, from The Museum of City and Sea, brought exhibits from days gone by to show the children. 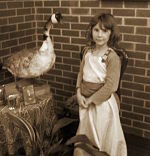 There were games, toys, clothing, photographs, and even a taxidermied goose! To relive a little of what children in past times did, the children firstly practised handwriting on slates, before each took a turn at churning butter! Some also tried making beads out of paper, playing games from yesteryear, and looking at 3D images in a viewfinder. The holiday programme concluded with the children having a taste of the butter they had made, before posing for some photographs dressed as children from times gone by. 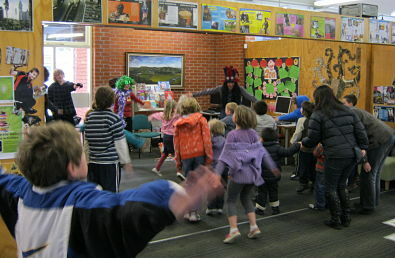 About 30 children and adults braved Wellington’s coldest day of the year, to come along to the World Wide Weird School Holiday Programme at Tawa Library, on Monday 25th July. Shelley and Brigid shared some disgusting and weird facts from The Guinness World Records, before taking the children through some weird challenges: balancing on one leg for as long as you could; doing as many star jumps as possible in 60 seconds; balloon lacrosse and balloon racing relays, as well as trying to cross your eyes and wriggle your ears. Their final challenge was the Weird Wardrobe Challenge. 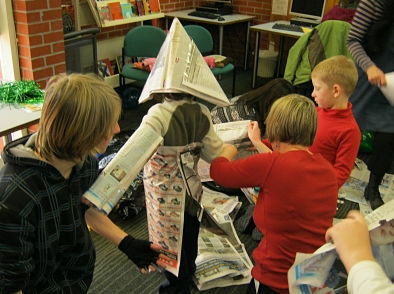 The children had to form teams and make one costume out of pieces of newspaper using only sellotape! Some teams came up with great costumes.Tawa Library’s next holiday programme will be in October, and should be just as much fun! School Holidays… What are you going to do? Wellington City Libraries are running free school holiday activities at libraries around town to celebrate New Zealand Book Month. Design a book cover, learn how to illustrate like a pro, make dog collars for Hairy Maclary, have fun with food and more! No bookings required – Check our website for which library, what theme and time. No bookings required at these fun family events. Go to the website for session times and locations or call 499 4444. 3… 2… 1… Lift Off! The holiday programme is underway with rockets being made and launched at Island Bay, Johnsonville, and Tawa Libraries this week! It’s totally free and heaps of fun! Launching Rockets is available for 9-12 year olds, all you need to do is bring a bottle to turn into a rocket. See here for more info. 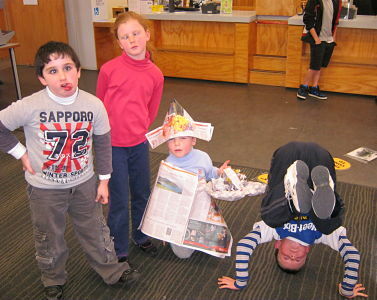 Wellington City Libraries’ School Holiday Programme is drawing to a close. So tomorrow is your last chance to get in on the recycling fun! Children from all over the city have been popping into their local libraries to get their hands mucky in worm farms, find out how recycling trucks work, learn what can and cannot be recycled and to make some cool art out of recycled rubbish. 11am-1pm Create a wicked sculpture out of recycled rubbish at Johnsonville Library, 11am-midday learn about worm farms and what happens to your recycling with some cool craft activities at Island Bay Library, 2pm-3pm more craft activities and the chance to crawl around inside a recycling truck at Miramar Library. They’re all fun and free! See you there!